Our exclusive CoolSculpting treatments, with its dual systems, compression therapy and vibration therapy, we believe will provide the most effective results possible for non-surgical spot reduction and fat elimination currently available. Our dual system treatment provides fat elimination in half the time as standard CoolSculpting. CoolSculpting Complete includes a post-treatment compression wrap and vibrational therapy to enhance results by increasing lymphatic drainage. 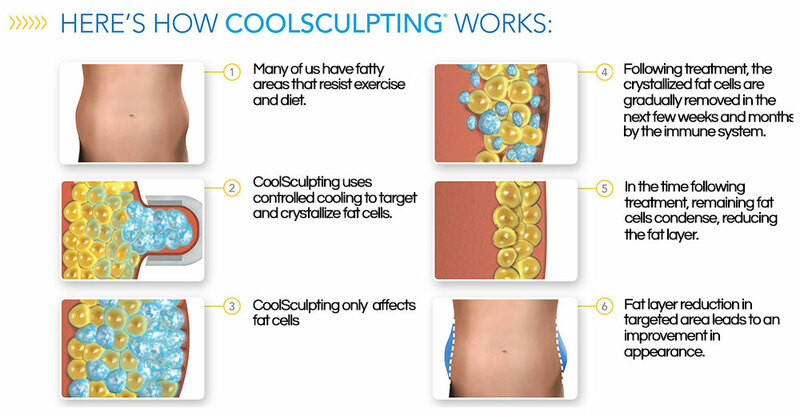 There is no additional charge for CoolSculpting Complete vs. traditional CoolSculpting. We want you to get the best results possible. After your CoolSculpting treatment you will receive a compression garment to assist with comfort level and achieving the best results. Follow these guidelines unless your CoolSculpting technician directs otherwise. Disposable clothing is provided for the treatment but you will want to arrive in soft, comfortable clothes to wear after CoolSculpting. Eat a light meal or snack before your appointment and limit beverages and caffeine immediately prior to your appointment time. Many patients enjoy watching Netflix or napping during their CoolSculpting treatment. Movement is limited during your treatment so it is not recommended to bring activities to occupy your time. We want you to sit back and relax. Some patients read, work on their laptops, listen to music, or sleep during their sessions. Following the consultation, if we determine you are a good candidate, we will proceed with treatment. Your CoolSculpting technician will begin by asking a few pertinent questions about your recent health history to ensure there are no contraindications for treatment. The technician will confirm your treatment plan. The treatment area will be prepared for treatment. The first few minutes of each session may be uncomfortable as the tissue is drawn into the applicator and the cooling begins. Most people find that the area goes numb with cold and the remainder of the treatment is comfortable. Each CoolSculpting session takes 35 minutes per area. When the applicator is removed the provider will massage the area to destroy up to 68% more fat cells. Many patients say that this tickles and is mildly uncomfortable. The treated area may ache for a few minutes after treatment as it warms back to body temperature. Your technician will talk you through the treatment to ensure you won’t experience any surprises. We are always mindful of your comfort and your peace of mind; we will let you know ahead of time what to expect. 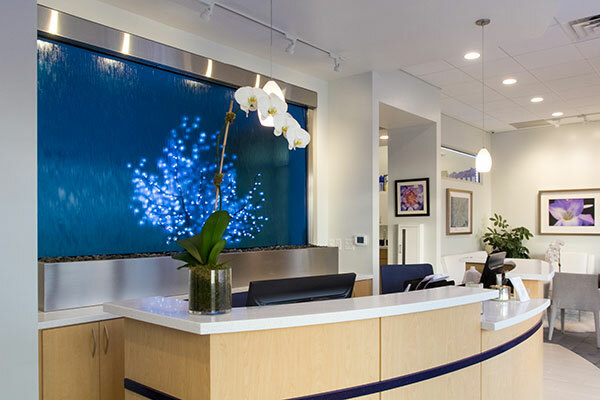 Each CoolSculpting treatment includes two Vibrational Therapy sessions. Vibrational Therapy after the CoolSculpting can enhance results by stimulating lymphatic drainage. The first should be received 1-2 weeks after your CoolSculpting treatment and the second will be received 3-4 weeks after treatment. **No appointment is necessary for Vibrational Therapy treatments. Typically, there is minimal discomfort and recovery time after the CoolSculpting procedure. Most patients are able to return to their daily routine immediately after the procedure. The treated area may be red for up to a few hours after the applicator is removed. Many patients have minimal discomfort following the procedure, however you may experience one or more of the following sensations: deep itching, tingling, numbness, tenderness to the touch, pain in the treated area, strong cramping, nausea, bloating, diarrhea, muscle spasms, aching and/or soreness. Contact our office if these conditions persist beyond two weeks or worsen over time. Following the procedure, a gradual reduction in the thickness of the fat layer will take place. You may start to see changes as early as three weeks after the CoolSculpting procedure and you will experience the most dramatic results after one to three months. Your body will continue naturally to process the injured fat cells from your body for approximately four months after your procedure. In rare cases, patients have reported darker skin color, hardness, discrete nodules, freeze burn, enlargement of the treated area, hernia or worsening of existing hernia following the CoolSculpting procedure. Surgical intervention may be required to correct the enlargement or hernia. Weight gain will prevent you from appreciating your full results. Maintaining a healthy diet and exercise routine after your procedure can help prevent this. Schedule a follow-up medical assessment 12 weeks post treatment to review your clinical results and discuss the option of additional treatments to achieve desired fat reduction.